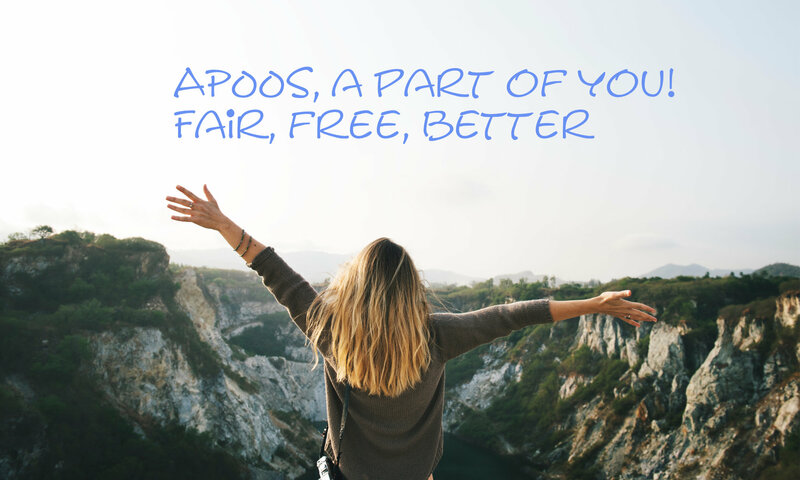 APOOS is part of you because we designed it for people like you and me. APOOS is the alternative to classic social media and sales platforms. Our concept is to make your life easier, better and safer. In doing so, APOOS will be sustainable and give you the opportunity to have a democratically co-decision on the future of the platform. Utility and security should make your life more beautiful. To increase the personal and business success as well as the feel-good factor of its members. If users save time, e.g. through a high degree of user-friendliness, a login, a profile and clear settings. The user can shop safely as possible, e.g. through our „purchase function“. Being independent and involving its members in future developments. Sales platforms, advertising markets and social media platforms are increasingly targeting users, their main interest being in maximizing profits for their investors. With the planned independent social media & marketing / sales platform, this should now be different, we want to treat users fairly and inspire with a variety of small innovation. Have you ever been angry about the following points? Your postings will no longer reach all your friends, instead you should pay for the publication of your postings. High fees for ad markets such as for cars, real estate or other vehicles. Notification of alleged activities of your friends that are not activities at all. Variety of access data on different websites that you need to remember. Different quality of websites, you do not know what happens to your data. Unclear or inadequate privacy settings. Scams that affect you as a buyer or seller. Do not worry anymore and look at our fair alternative! The new fair social media & marketing platform should offer you the following. Hundreds of opportunities for your daily life – private and business -! Hundreds of possibilities for your daily life & business! Social media users want more interaction! and introduce multiple levels for reviews. … This platform will bring millions of people forward and treat them fairly at the same time. Functions in the fair platform. 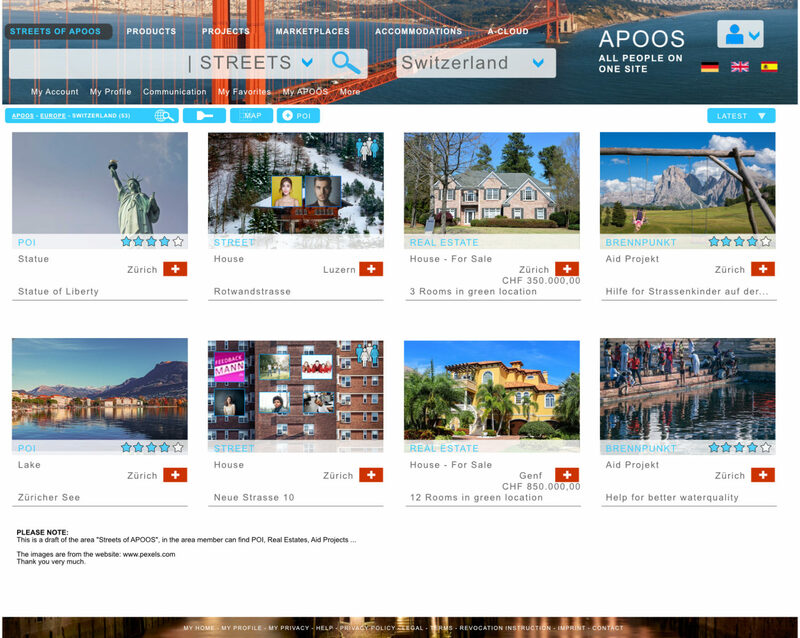 The “streets of APOOS“ lead to multiple destinations within the internet platform. The platform includes products and projects, A-Cloud, blogs in multiple languages, accommodations, and worldwide marketplaces. 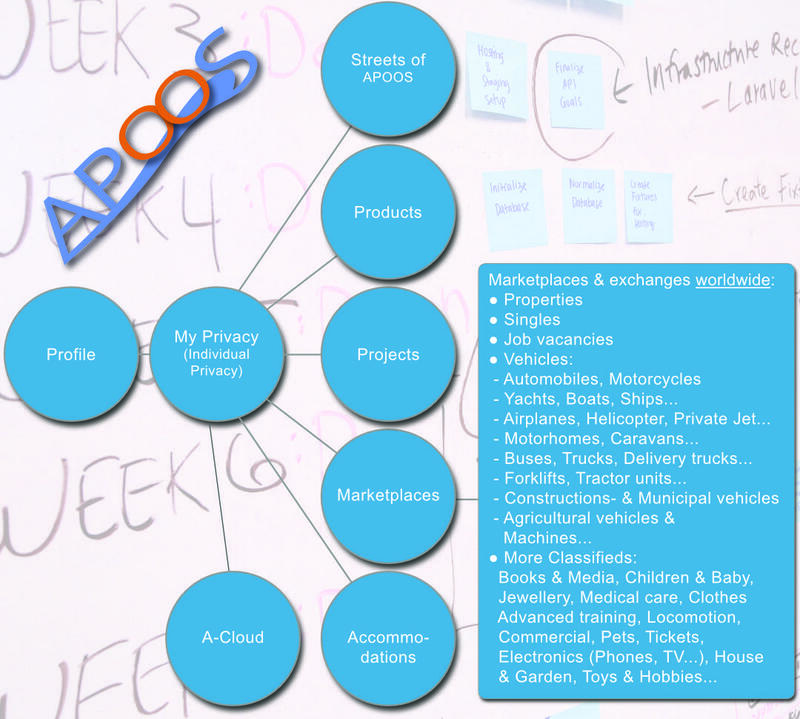 APOOS accommodates individual users, businesses, entrepreneurs, non-profit and charitable organizations. Networks can be created for any need and every user is in full control of the people, businesses and organizations that view their information. Individuals can create multiple groups and businesses can choose minimal marketing or a more elaborate presence with products. The APOOS mail system enables members to communicate securely and with Autotext, text messages can be saved and recalled at will. The APOOS “buy function” in the marketplaces enables members to make offers on a variety of items, arrange shipping or a local pickup, and set time limits on availability. Other users will also be able to identify any individuals that have defaulted or failed to deliver on a marketplace deal. Self-determined membership fee: You decide if you want to pay a membership fee and how high it is. Co-determination is also important to us, so APOOS members should decide how APOOS should evolve in the future. Features & possibilities: Community with self-determined privacy and even across groups and divisions. Self-determined membership fee: You decide if you want to pay a membership fee and how high it is. Free basic membership possible – thanks to a broad concept – use. „Purchase feature“, members can make limited bidding. Self-determined privacy is a key issue. In a nutshell, a member determines for himself which of his data is visible. This not only for his groups, but also for the different areas. The settings for this can be found later in the privacy center. Design should not only be chic, but also functional. Thus we strive for a clear appearance, with functions that repeat themselves. Orientation is thus possible in all areas. Via the navigation link of „My Home“, the user will be able to control all areas clearly, without having to search long for hidden functions. Under „My Privacy“ is the Privacy Center, where members will determine who, who, which or not their content can see.